You think your LAN network is safe. Not a chance! We will show you how vulnerable your network is. On the first day you learn how to defend your LAN from attackers. By the end of the day you will be able to prevent layer 2 attacks by configuring Catalyst switch security features. CBAC, what it is and what it does. You will learn how to configure a powerful firewall on your router, you will learn how to set up CBAC using the CLI and CCP and you will learn how to configure IOS TCP Intercept and Transparent IOS Firewall. You will understand and explain what it means for a firewall to be stateful along with the operations and the function of the state table. • Define network based vs. host based intrusion detection and prevention, learn the difference between false positives and true negatives. • Explain IPS, signatures, honey pots, policy based IPS, Fail opens and Fail closes, attack responses, and monitoring options. • Secure the Cisco IOS image and configuration file. Designed to build knowledge and show competency with network security, the CCNA Security qualification from Cisco focuses on the latest hardware and software from the market leader in networking. With a huge demand for job-ready network security experts, the CCNA Security certification is a great way to qualify IT professionals for a range of roles in an established area of the industry. Holding a CCNA Security certification highlights competency in installing, troubleshooting, and monitoring network devices with an emphasis on safety and security. With a clear focus on core security technologies, this certification shows that a network professional is able to recognize and stop threats before they develop, as well as identifying and fixing network vulnerabilities before they are exposed. At Commsupport, we include real-world, hands-on experience with ASA technology with our CCNA Security course, because we appreciate what hiring companies expect from their network engineers. Getting hands-on experience with ASA while studying the CCNA Security course will ensure you are ready to hit the ground running as a network security engineer after you receive your qualification. We are the only technical training company focusing not only on passing the Cisco CCNA Security exam but also focusing on ensuring that all our students are put through their paces with our unique comprehensive Lab manuals and classroom technical practical exercises. Our CCNA Security training course lab manuals are a product of nearly 10 years of continuous development. 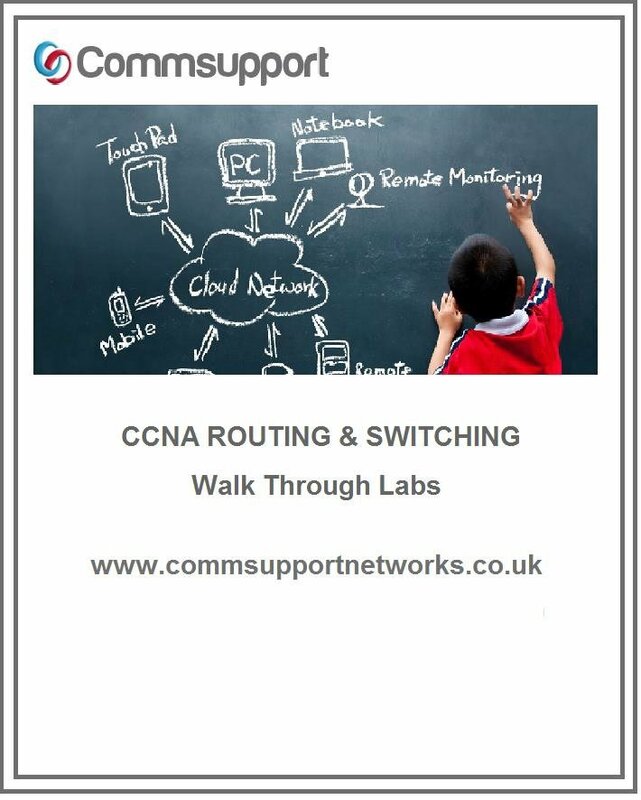 Our CCNA Security training course lab’s manuals are responsible for creating great network engineers. Contact us for a sample of one of our labs. With our CCNA Security training course, you will benefit from a deeper understanding of the Cisco ASA Firewall along with Site-To-Site VPN’s, Anyconnect VPN’s, VTI tunnels, DMVPN tunnels. We really throw the book at our students when it comes to VPN’s and Firewalls. Your Instructor-led CCNA Security training course Is RECORDED from start to finish, That’s right from the first to last, every word and every example and every piece of configuration is recorded in real time just for you, at the end of your course you will have access to the recordings of the class you just attended, We were the first and are the only training company in the world which does this. If you feel you need more time and instruction, you can come back onto the course for free from anywhere in the world provided you have internet access via our unique Virtual On-Line CCNA Security training course or come back to the classroom. When you book your course you can start pretty much straight away if that course is running that week. Once again we are unique in allowing you to come and visit us in the classroom sit with the students and see for yourselves if we are right for you, or alternatively, you can access the classroom remotely via GoToMeeting where you can hear and see the classroom lectures. Please contact us before you plan to visit. Who is this CCNA Security training course for? This is an ideal course if you’re looking to move up the ladder in the Cisco world. All you need is the Cisco CCNA certification and then you can go into the Security aspect. This means it is very accessible, especially to current Networking Engineers and if you’re new to the industry. Job roles: Security Specialist, Security Administrator, Network Security Support Engineer and Network Administrator. Salary: As a Cisco Security Specialist, the current median salary in London is £57,500. We appreciate that the cost of the course can be a major deciding factor. To ease the process, we offer a Finance option which is easy to apply for and you get accepted within a few minutes! This option can be funded extremely quickly and we will tailor the plan around you. Please give us a call or enquire and we’ll discuss it further with you.